Few keen drivers would disagree that the opportunities afforded by a trackday are becoming harder and harder to come by elsewhere. Out on the roads congestion seems as inescapable as the all-seeing eyes of the enforcement cameras and each new car industry advancement seems to further remove the driver from the act of driving. Here we’re rounding-up our 10 best trackday cars, the new models best adapted to maximising your circuit driving experience in terms of sheer unadulterated fun. We recognise that for many, many trackday drivers a good trackday car is a cheaper, slightly older machine with track-biased tyres and a few choice tweaks to enhance its abilities on a race circuit but we’re leaving those to one side for the moment. Here we’re looking for new models that excel on track straight out of the box while retaining enough decorum to be driven home again afterwards. We’re looking for cars that reward and entertain drivers of various skill levels while offering value for money and a generally outstanding ownership proposition. We don’t think that’s too much to ask. The Peugeot 208 GTi is a return to hot hatch form for the French brand after some time in the wilderness but driving the pacy, refined original car, few would have guessed how adept on track the hotter Peugeot 208 GTi by Peugeot Sport would turn out to be. 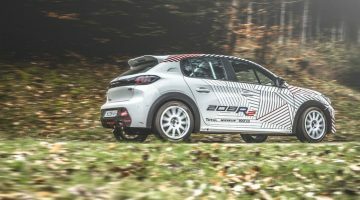 The PS version sits 10mm lower than the standard GTi on stiffer springs fore and aft (30 and 80 per cent respectively) while there are also bespoke dampers perched on a track that’s 22mm wider at the front and 16mm at the rear. There’s also a limited-slip diff through which 205bhp and 221lb ft of torque is delivered to the standard fit Michelin Pilot Super Sport tyres. The spring and damper combination underpinning the BMW M4 Competition Package reappears in the CS, though the dampers and steering have been reconfigured to harness Michelin’s stickiest track rubber. The staggered wheel setup, 19-inch at the front, 20s at the rear, give the Active M-differential the greatest chance of extracting the grip and traction offered up by the Michelin Pilot Sport Cup 2s. Power and torque have swelled over the standard car by 10bhp and 37lb ft to give 453bhp and 442lb ft respectively, while M’s engineers managed to find an additional 32kg of weight savings with extensive use of carbonfibre. The CS is exclusively equipped with the DCT twin-clutch gearbox. Driving through a manual or twin-clutch gearbox, the Porsche GT3’s 4-litre flat-six churns out 339lb ft of torque at 6000rpm and 493bhp at 8250rpm. 0-100kph is dealt with in less than 4sec and an autobahn blast could take you to nigh-on 200mph. The rear end is now suspended with helper springs for improved traction and bump-absorption. The GT3’s aero armoury presses the Michelin Pilot Sport Cup 2s into the tarmac, generating anywhere up to 155kg of downforce. Augmenting the traction-friendly rear-engined layout, the limited-slip differential (electronic with the PDK, purely mechanical attached to the manual) helps the GT3 hook up and punch out of corners. Sandwiched in the Elise range, the Sprint is more focused than the Sport but less extreme than the Cup and Race variants. The more powerful Sprint 220 is fitted with Toyota’s 1.8- litre supercharged engine, producing 217bhp and 184lb ft of torque allowing the lightweight roadster to sprint to 100kph in 4.1sec. Weight saving measures have trimmed 26kg from the Elise 220, dropping the kerb weight to 878kg – simplify and add lightness goes the saying. Forged alloy wheels and a deliberate use of carbonfibre has given the Sprint 220 featherweight status. To underline that the Sprint wears unique styling cues, most notably the functional, enlarged intakes in the front apron. Sharing Mazda’s current fourth generation MX-5 platform is a great start for the Abarth 124. Track-sympathetic hardware including a strut brace and LSD helps to transfer power through the neatly balanced rear axle. The Italian roadster is torquier than its Japanese cousin, with its 184lb ft of twist combined with 170bhp providing enough shove to enjoy more tightly configured circuits. The traditional, rear-drive sports car tips the scales at 1060kg, so punching round circuits lap- after-lap won’t devastate consumables in the same way that heftier cars can eat into their tyres and brakes. More track days will cost you less as a result. 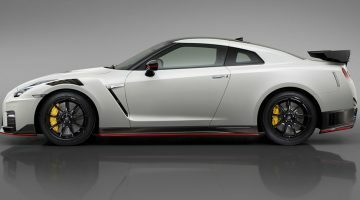 The Nismo’s sophisticated all-wheel drive system constantly shuffles 481lb ft of torque to conceal its hefty 1720kg kerb weight while the 3.8-litre V6’s 591bhp goes someway to explaining the astonishing 2.5sec 0-100kph time. The Nismo boats a Nurburgring time 4sec (7.08.68) quicker than the Porsche GT3, leaving you in no doubt to its track credentials. Structural rigidity is up eight per cent (over the standard GT-R) allowing for a stiffer suspension setup. The finely-tuned aero-package endows the GT-R with (even more) sculpted lines to increase downforce by 100kg at 300kph aiding the four-wheel steering system in high-speed direction changes. ‘I’d noticed how firmly suspended it was in town earlier, the whole car thumping over manhole covers and pattering loudly across stretches of pavé like a race refugee. Clearly the engineers haven’t been shy about the set-up. A 62kg diet sees inessentials binned and numerous body panels and parts recast in carbonfibre – although the standard Exige tips the scales at a hardly-portly 1119kg. The strict no-weight policy yields a power-to- weight figure of 355bhp/ton that endows the Cup 380 with a 0-100kph time of 3.6sec. A six-speed gearbox, bearing a beautiful exposed linkage, channels the mid-mounted V6’s 375bhp and 302lb ft to the rear axle. Six selectable traction control presets allow different degrees of slip angle from one to twelve per cent while there’s scope for adjustment in the Nitron dampers and Eibach anti-roll bars to fine-tune the setup. ‘Dynamically, the Cup operates on a plain some way above what can be fully experienced on the public road. However, so engrossed are you in the driving experience that this Lotus provides more sheer enjoyment than most modern supercars combined. An extended rear wing, carbon seats and lightweight alloys – shod in Pirelli P Zero Corsas – constitute the Track Pack and drop its weight by 25kg. The rear wing floats 12mm higher generating 29kg more downforce (at 240kph) over the standard car. 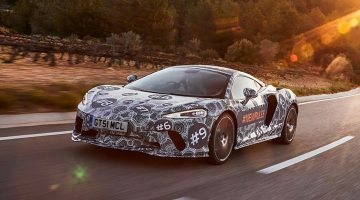 McLaren has left the blown 3.8-litre alone; 443lb ft of torque comes fully on stream at 5000rpm before all 562bhp is available at 7400rpm. Hovering between the two crank speeds is easy work with a seven-speed dual-clutch transmission on hand taking care of shifting. The reach of the twin-turbo unit allows the focused McLaren to sprint from 0-200kph in 9.5sec. The R pack ($5930) adds plenty of track kit to the Caterham 420: a LSD, lightweight flywheel, sports suspension and slicker rubber are a few of the additions. The 560kg kerb weight negates the Ford motor’s modest output – 210bhp and 150lb ft of torque – and the 420R thus boasts a power-to- weight figure that eclipses the Exige 380 Cup. Deft use of the five-speed manual (a six-speed ’box is an option) should keep you fluctuating between peak torque and power at 6300rpm and 7600rpm respectively. The 420R covers the 0-100kph sprint in 3.8sec and runs out of puff at 219kph. The Honda sourced powerplant sits in the exoskeleton space frame – all in it weighs just 550kg. The VTEC unit hanging over the rear is paired with a supercharger – boost pressure is turned up to 11psi – to make 350bhp at a lofty 8400rpm. The torque output is a respectable 243lb ft. The sequential ’box facilitates flat shifting and can rifle through five consecutive downshifts in under a second. The Ariel is the most compromised in terms of practicality (in this list), but the trade-off is a unique driving experience – and the F1-style aero package goes someway to communicating this. Previous ArticlePolestar teases first independent model – could this be a real M3 rival? Next Article Koenigsegg smashes the 0-400-0 kph record. Checkmate Chiron.